View of Thundridge, near Ware in Hertfordshire. Thundridge is situated two and a half miles from Ware on the important Roman Road known as the Great North Road or Ermine Street. It is thought that the building in this print is Thundridge Bury which was the home of J. Hollingsworth. The house originally dates from the 16th century but was modernised in the late 1700s. 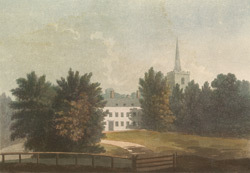 The church tower can be seen rising above the trees to the right of this print. This is the only portion of the original church which remains as in 1853 the church buildings, apart from the tower, were demolished and rebuilt.